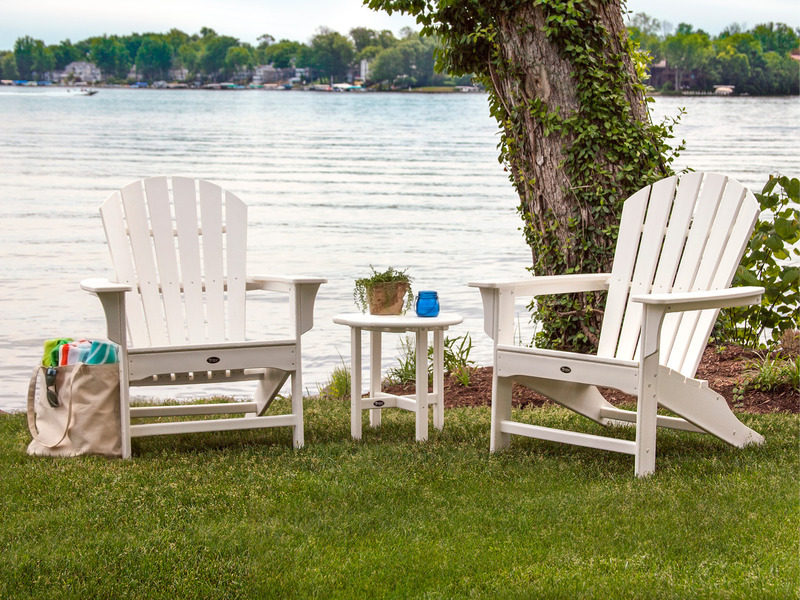 Classic Adirondack chairs are designed for maximum relaxation outdoors, whether you’re sipping tea on the patio or soaking up some sun poolside. The Adirondack chair provides excellent support due to its backward sloping seat and back that sits close to the ground. 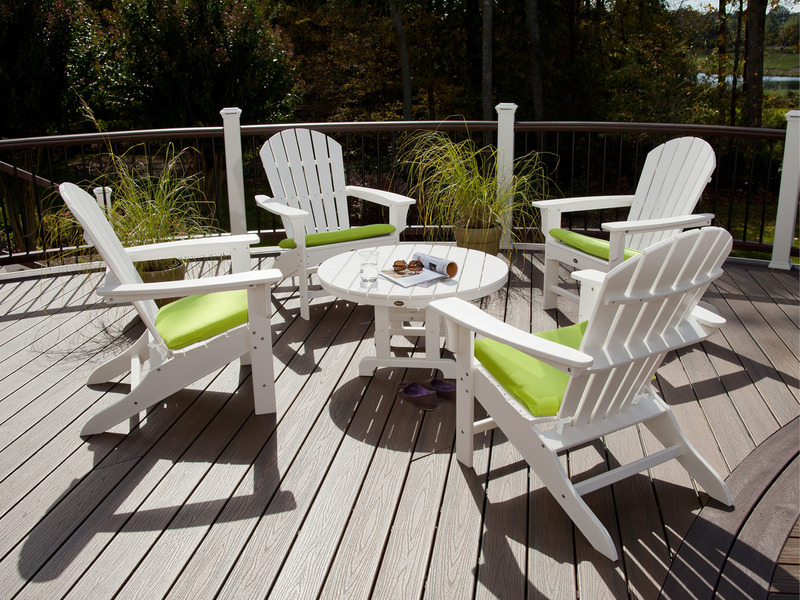 Many types of Adirondack chairs feature contoured seats and backs for additional comfort. The wide arms provide a convenient place to balance a drink and solid grip when you need to lift yourself out of the chair. Deciding to buy an Adirondack chair is the easy part – once you start to shop around you’ll find you have a wealth of material, size, and color options that can make the process confusing. Follow this comprehensive guide to demystify the process and find the perfect set of Adirondack chairs for your outdoor space. 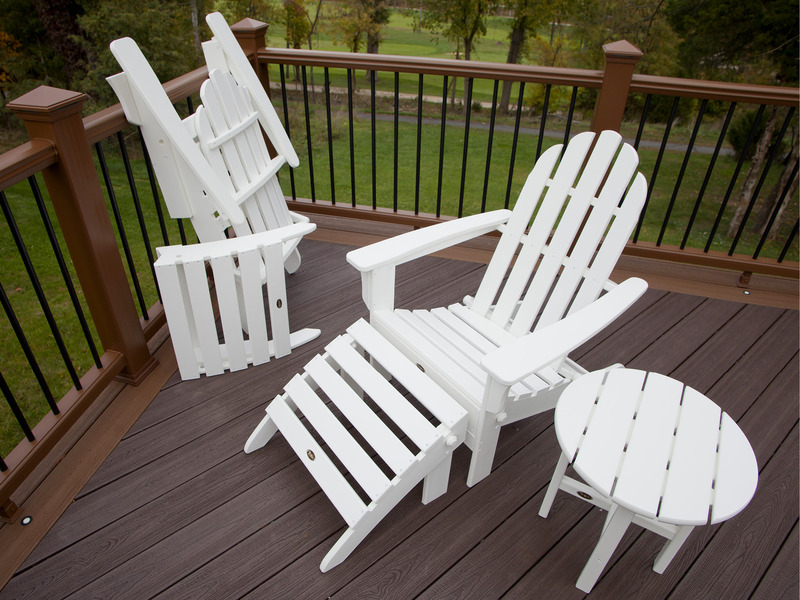 The primary materials used to construct Adirondack chairs are aluminum, teak, plastic, and HDPE lumber. How long does the material last, and therefore how much value does it provide? How easy is material maintenance cleaning? How much does the chair weigh, and how much will it stand up to wind and rain? Aluminum chairs are available but are less popular due to their level of comfort and metallic appearance. Aluminum is a lightweight yet durable metal that is tough and resilient. Aluminum can remain outside year-round, as it is resistant to rain and rust. Aluminum is lightweight and therefore can be toppled over with strong wind gusts. Aluminum furniture is only available in one color, the natural silver finish. Aluminum furniture is less comfortable than other options. Aluminum is generally less expensive. Teak is more durable and requires less maintenance than other types of wood used in outdoor furniture, including oak, wicker, bamboo, and pine. Teak can remain outside year-round, as it is resistant to wind, rain, and rust. Teak is a resilient hardwood and cannot scratch or dent easily. Teak is only available in one color, “teak,” its natural wooden hue. Teak is one of the most expensive options for Adirondack chairs. You are likely familiar with plastic Adirondack chairs – they are the most affordable option and also the least comfortable and durable, making them a popular choice when you just need a few extra chairs or temporary furniture. Plastic is easy to maintain with a simple cloth and soap. Plastic is lightweight and can be blown over with a gust of wind or break when sat in. Plastic is available in many different colors. Plastic will fade, weather, crack, and take on stains quickly. Plastic is not luxurious or very comfortable for long-term sitting. Plastic is the least expensive option for outdoor furniture. HDPE is a synthetic resin used to construct durable, high-quality Adirondack chairs. This superior quality is reflecting in the cost of HDPE lumber. HDPE lumber can remain outside year-round and is completely resistant to wind, rain, and rust. HDPE lumber is easy to maintain with just a damp cloth and dish soap. HDPE lumber is durable and medium weight, meaning it won’t topple but is easy to carry. HDPE lumber is available in a wide range of colors. HDPE lumber features a luxurious, comfortable construction that will retain quality for years. HDPE lumber is the most expensive material option for Adirondack chairs. At Trex® Outdoor Furniture™ we manufacture our Adirondack chairs with HDPE lumber because this material is completely recyclable, weather-resistant, and lasts a lifetime. However, consider your budget and other factors before deciding on a type of material. The initial 1903 design of the Adirondack chair has evolved yet remained true to its spirit: a simple, comfortable outdoor chair composed of slatted wood planks that sits low to the ground. We have perfected and altered the style with features like contoured shellbacks to provide maximum comfort and support while you lounge. At Trex Outdoor Furniture we offer several styles depending on your needs and budget: Cape Cod Adirondack Chair – our standard and most affordable Adirondack chair features a traditional back design of five slats and a curved top. A contoured seat allows you to sit peacefully for hours. Cape Cod Folding Adirondack Chair – Take the comfort and relaxation of the Adirondack chair anywhere with a folding model weighing 39 pounds that sports the same traditional back design as the Cape Cod Adirondack Chair. Yacht Club Shellback Adirondack Chair – If your budget is a little higher consider the Shellback Adirondack chair that boasts an intuitively contoured back design with six slats for extra support. Cape Cod Ultimate Adirondack – Get the most function out of your Adirondack purchase with a model that contains folding capabilities and includes a unique hideaway ottoman for added convenience. 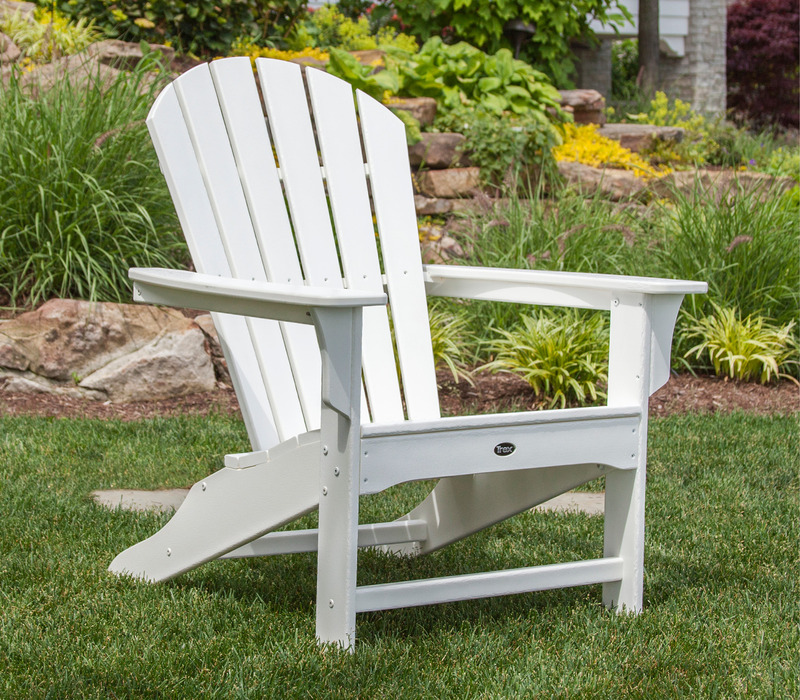 Cape Cod Adirondack Rocking Chair – Outfit your front porch with an Adirondack rocking chair featuring the same traditional slatted back design and contoured seat of the Cape Cod Adirondack Chair, coupled with a higher seat height and a strong base for smooth rocking. 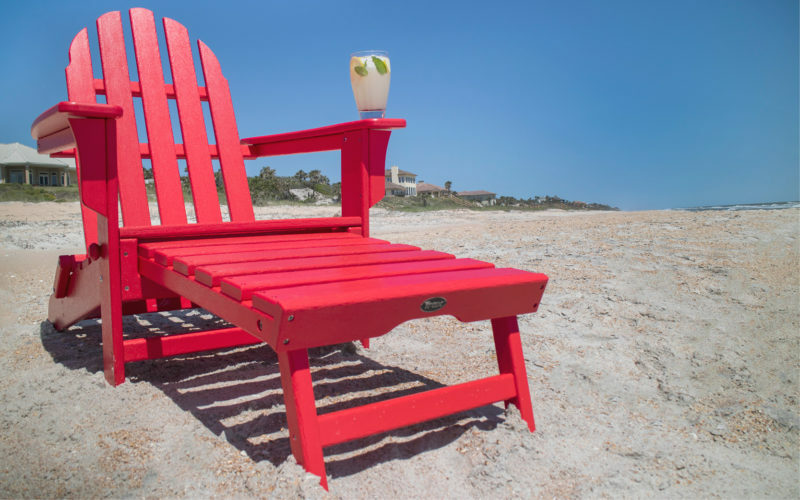 While teak and aluminum Adirondack chairs will have limited color and finish options, with plastic or HDPE lumber chairs you can choose several different hues, from natural tones to bright, vivid colors. Trex Outdoor Furniture stocks Adirondack chairs in seven traditional earth tones and all-new vibrant color options you can customize to match the other furniture and design elements on your deck, patio, or porch. Before you make your final selection consider the average height of your chairs and how the amount of space you have to work within your outdoor area. Typical Adirondack chairs vary between 35 to 38 inches in height, and the seat height is usually between 13 and 16 inches off the ground. Adirondack chairs at Trex Outdoor Furniture usually measure around 14 inches in seat height. If you are less than 5’5” in height you’ll want an Adirondack chair with a seat height between 13 and 14 inches, but if are closer to 6’0” a chair with a seat height between 15 and 16 inches will prove easier to get out of. Adirondack chairs can weigh anywhere between 10 and 45 pounds depending on the material used and the size of the chair. Lighter chairs are easier to move and carry, but heavier chairs will resist wind and weather damage better. Place Adirondack chairs at least two-to-three feet apart, and leave three-to-four feet of space in front of each chair so you can stand up without difficulty. For a standard patio of 10 square feet this means three or four Adirondack chairs can fit in the space. You really won’t want to leave your Adirondack chair if you add some accessories for further comfort. An ottoman or footstool like the one that comes with our Cape Cod 2-Piece Folding Adirondack Set empowers you to sink back and relax without a care. A cushion or pillow will also up the ante and allow you to sit for hours without causing any soreness. Add a Sunbrella® cushion to your Adirondack chair set: the weatherproof fabric retains its color so you can leave it out in the sun all year long. Choosing the right outdoor furniture for you can be a challenge, but with this handy guide you can select an Adirondack chair or set with confidence. Learn more about the timeless design and materials of our Adirondack chairs on our blog. Shop today to find a high-quality, low maintenance Adirondack chair that is worth the investment.